Vienna Design Week 2010: Berlin designer Mark Braun presented a series of carafes engraved with images of lakes, glaciers and rivers of Austria for glass company Lobmeyr in Vienna earlier this month. Developed as part of the Vienna Design Week Passionswege project bringing together young designers and companies with a long tradition, Braun's project involved etching the glass with three different processes. The resulting pieces were displayed filled with water collected from the relevant site over the last year by the organisers of Vienna Design Week. Graphic designer Anna Sartorius created postcards showing each lake, river and glacier with images from Google Earth and information comparing the area of water with the amount of time the engraving took. The installation at the Lobmeyr showroom was entitled Reichtum (wealth), and refers to the different prices of each carafe based on the time taken to engrave them. The company J. & L. Lobmeyr has been working with the material glass for almost 200 years and continues until this day to rely on handcrafted perfection in creating its chandeliers and other lighting objects, its hand-blown and hand-cut crystal, and decorative glass. 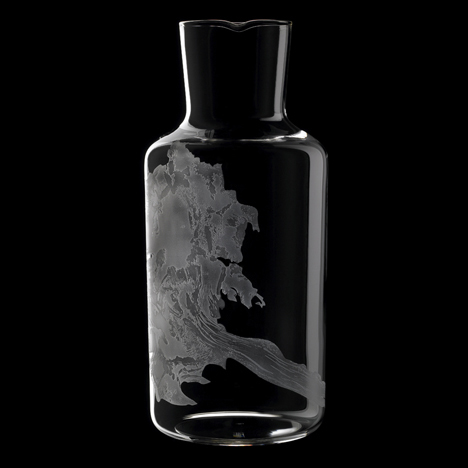 Starting from the Lobmeyr tradition of personalising glass objects with engraving or decorating them with eloquent patterns or ‘paintings’, the German designer Mark Braun has realised a series with the emphasis on water on the one hand, and glass on the other. Two substances that are at least strongly related visually. Using the copper wheel engraving technique, archetypical water carafes especially designed for this project have been decorated with the outlines of Austrian lakes, rivers, and glaciers. For Mark Braun the sum total of these makes up the symbol of the essential wealth of everyday life. The installation ‘Reichtum’ [Wealth], also the title of the presentation, stages the carafes filled with original water! The PASSIONSWEGE format, a core component of the VIENNA DESIGN WEEK, brings designers together with Vienna shops and manufacturers with on-the-spot experimental projects and interventions.